Bran Schot, left, has been appointed interim CEO of Audi. Rupert Stadler has been suspended, a source told Reuters. FRANKFURT -- The supervisory board of Audi has suspended CEO Rupert Stadler and appointed Bram Schot as an interim replacement, a source familiar with the matter said on Tuesday. 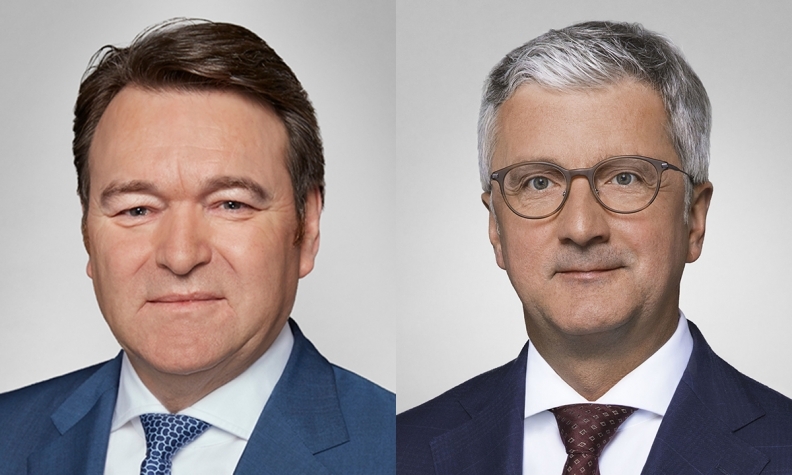 German broadcaster Bayerischer Rundfunk was first to report that Stadler, 55, was suspended and that Schot, 56, was now interim CEO at Volkswagen Group's most profitable brand. Two people familiar with the matter told Reuters earlier that parent company Volkswagen's group supervisory board was due to be informed in a telephone conference around noon local time about proposed changes at the top of Audi. The arrest of Stadler on Monday threw VW back into turmoil, as it raised fresh questions about whether the company had done enough to reform itself almost three years after it admitted to rigging U.S. emissions tests on diesel engines. Stadler has been under fire from the media, politicians and VW's powerful trade unions for his handling of the scandal, but he survived a major management reshuffle announced in August thanks to backing from the Piech and Porsche families that control VW Group. VW Group's supervisory board suspended crisis talks to find a stand-in boss for Stadler at Audi on Monday after a six-hour meeting. "The supervisory boards of VW and Audi have not yet reached a decision and continue to assess the situation," a VW spokesman said on Monday, declining to elaborate. Plans to quickly appoint Audi sales boss Bram Schot as the unit's interim CEO following the arrest Stadler encountered resistance, people familiar with the matter told Bloomberg. Some board members were against at making a hasty choice. With Schot, Audi's head of sales and marketing since September, VW would be going with an executive so far untainted by the emissions scandal. The 56-year-old Dutchman joined VW from Daimler in 2011. Board members had planned a routine gathering at VW Group headquarters in Wolfsburg, Germany, on Monday but they were caught by surprise by Stadler's arrest, and the get-together quickly escalated into a crisis meeting, said the people, who asked not to be identified because the deliberations aren't public. Audi is the VW group's largest profit contributor and it can ill-afford a vacuum at the top. Stadler's arrest is the first among VW group's management board members in connection with the diesel scandal. The arrest started a new debate over VW's governance which could raise tensions on its supervisory board, putting at risk a fragile truce between management, VW's controlling Piech and Porsche families, as well as representatives from labour and the region of Lower Saxony. VW has for years said only lower-level managers knew of the emissions cheating, but U.S. authorities filed criminal charges against former VW boss Martin Winterkorn earlier this year, and Munich prosecutors widened their probe into Audi this month. Stadler was given additional responsibilities for group sales in a revamp announced by VW Group's new CEO Herbert Diess in April. VW has set aside around $30 billion to cover fines, vehicle refits and lawsuits since its diesel scandal broke, and has announced plans to spend billions more on a shift to electric vehicles as it seeks to rebuild its reputation. Whereas group CEO Martin Winterkorn resigned in the days after the cheating was disclosed, Stadler resisted requests to fall on his sword, and instead received backing from the Porsche and Piech families to remain in his post. "His arrest is another low point in VW's diesel saga," said Evercore ISI analysts, who have criticized the group for a slow pace of reform. "Almost three years after the diesel scandal broke, it takes police to take action against the Audi CEO." The United States filed criminal charges against Winterkorn in May, but he is unlikely to face U.S. authorities because Germany does not extradite its nationals to countries outside the European Union. The Munich prosecutors said the move against Stadler was not made at the behest of U.S. authorities. The 55-year-old was arrested at his home in Ingolstadt in the early hours on Monday, they said. "The arrest warrant was made because of a risk that evidence might be suppressed," Stephan Necknig, a spokesman for the Munich prosecutor's office, told Reuters Television. "During a search last week there were signs that the accused may tamper with evidence. To influence other suspects or witnesses, or people who could provide information to the investigating authorities," he said. Sueddeutsche Zeitung, citing sources close to the investigation, said prosecutors had tapped Stadler's phone just before searching his premises last week. Audi and VW said Stadler was presumed innocent unless proved otherwise. Stadler himself was not immediately available for comment. VW shares closed down 3 percent at 156.06 euros ($180.28), one of the biggest falls by a European blue-chip stock. Asked whether U.S. authorities were also seeking to arrest Stadler, a spokesman for the Department of Justice said: "As a general matter, the department will neither confirm nor deny the existence of any ongoing investigation." Stadler has been under fire since Audi admitted in November 2015 - two months after parent VW -- that it also installed illegal "defeat device" software to cheat U.S. emissions tests. Stadler has held onto his post mainly thanks to the backing of members of VW's controlling Porsche-Piech families. Before becoming Audi CEO in 2007, Stadler worked as chief of staff to VW's former chairman and industry scion Ferdinand Piech. Most of VW's emissions problems have been in the United States, where a total of nine people have been charged and two former VW executives have pleaded guilty and been sentenced to prison terms.